Puzzling Queen: When does a puzzle qualify as a Nonogram? 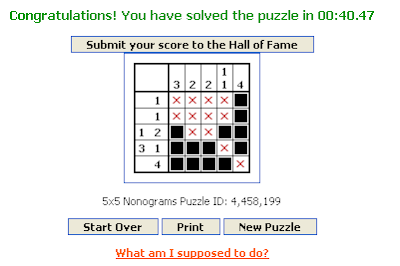 When does a puzzle qualify as a Nonogram? Nonograms are picture logic puzzles in which cells in a grid have to be colored or left blank according to numbers given at the side of the grid to reveal a hidden picture. These puzzles are very addictive and the fabulous reward for solving the puzzle is a great picture. I search now and then new sites with these puzzles but sofar I haven't found even a good challenge for Conceptis; to say nothing about a winner. It is solved even tough there remains one unopened square. Checking closer to the lower right-hand corner reveals the awful truth: I could have place the one in the bottom row also to the remainig square and the solution had still been right according to the clues. I made this quess and got the puzzle right. Anyway this puzzle has two solutions! I have no way of knowing if the program would have claimed I was wrong if I had chosen the other square. This is not the first time when I see games like this. 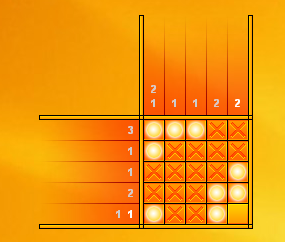 The site puzzle-nonograms.com has the same concept; all that matters is the solution time. I have never cared how long it takes me to solve the puzzle. There are many games developed for those who want to train their speed. Wanting to solve the puzzle as fast as possible leads so easily to guessing. I think the puzzles mentioned above should change their name. They definitely not are nonograms or picrosses. Thanks for pointing this post out to me. I agree with you that the fun of picto puzzles is a) getting an image afterwards and b) taking your time and solving it...like a cross stitch project. Puzzles which make you solve it in fast time are in a different category. Recently i came across Gemsweeper, whiich is nongram puzzle from the site www.lobster.com. I have really enjoyed playing it and the graphics are wonderful and user friedly. have a look. Recently i came across Gemsweeper, whiich is nongram puzzle from the site www.lobstersoft.com. I have really enjoyed playing it and the graphics are wonderful and user friedly. have a look. I forgot to add a link to Gemsweeper, here it is: http://www.lobstersoft.com.